Jojobaby Baby Boys Girls Hooded Snowsuit Winter Warm Fur Collar Hooded Down Windproof Jacket Outerwear (6-12 Months, Black) by Jojobaby at Sherlock Coat. Hurry! Limited time offer. Offer valid only while supplies last. 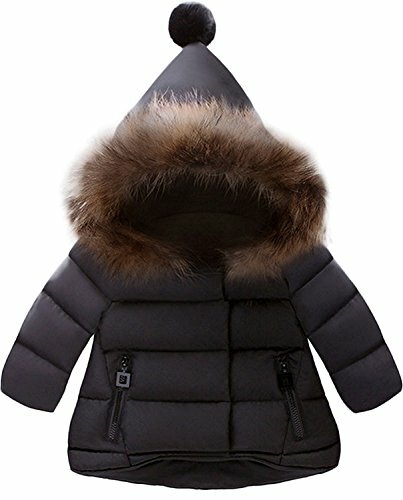 Baby Boys Girls Winter Warm Puffer Fur Collar Hooded Jacket Package Including: 1*Kids Boys Girls Parka Down Zipper Coat Padded Cloak Overcoat. Package Including: 1*Kids Boys Girls Parka Down Zipper Coat Padded Cloak Overcoat. Occasion: Dressy Party Holiday Everyday. Hand wash is highly recommended. This Is Best Gift For Your Lovely Baby,Grandson,Nephew. Your Baby Can Be Dressed In Daily Life, Special Occasions or Party. Kids girls' outwear clothing-with adorable overall design, a fur hood, and water resistance outer shell, wind protected. Material: Cotton Blend,Faux Fur,Comforfable and Warm,windproof and keep warm. Concealed zipper closure with snap placket, Slanted side handwarmer pockets. Season:Spring, Autumn, Winter,Suitable for Christmas, New Year, Birthday party, Photography ect, also ideal for a casual daily wear,,Best Gift For Your Baby Boy/Girl. If you have any questions about this product by Jojobaby, contact us by completing and submitting the form below. If you are looking for a specif part number, please include it with your message.